Learn about career pathways in manufacturing including design, engineering, machinist, sales, marketing, customer service, accounting, and more. Meet area employers. Find out what they look for in future employees. Make connections for possible internships/ apprenticeships and hand-on experience! Students attend Expo and Demos. Attendees will gain insight into the modern world of manufacturing and other high priority occupations. Careers in these sectors will be exposed for what they really are - creative, high-tech, and rewarding! Parents can learn about alternative post-high school career paths for students that offer excellent opportunities and do not require a burdensome financial investment. School students can meet area employers and connect with them about employment possibilities. Take our student feedback survey so we can make next year's event even better! 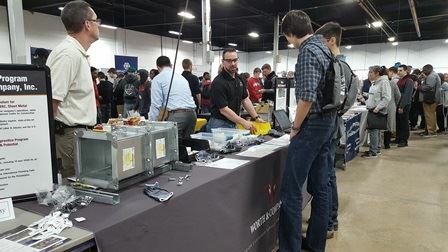 ManuFest and More was held on March 12th, 2019 and included an expo of local and regional employers from the manufacturing industry and construction trades. Exhibitor demonstrations and hands-on activities highlighted the high paying jobs available in manufacturing and construction trades and the skills needed to obtain them. The event was attended by over 1,200 students along with parents and educators. Keep an eye out for ManuFest and More 2020! Congratulations to the 26 raffle prize winners! Bring Your Skill to the Manufacturing Industry: We Need You! Careers In Advanced Manufacturing: Why Parents Should Say YES! Apprenticeships in Manufacturing: Earn & Learn and Offset College Costs! The 4th Annual ManuFest was held at Montgomery County Community College (MC3) Central Campus on Saturday, March 11, 2017. Event partners that bring to light the advances in manufacturing and assist in building the pipeline of talent with the future workforce came together once again: Montgomery County Workforce Development Board (MontcoWorks), Bucks County Workforce Development Board (BucksWorks), Manufacturing Alliance of Bucks and Montgomery Counties, Montgomery County Community College, Montgomery County Commerce Department, and MidAtlantic Employers' Association (MEA).